An icebreaker activity differs from other icebreakers in that it is active or requires an expenditure of energy. Many of our ice breaker activities frequently last longer than other icebreakers and many require some advance preparation. They are designed to energize a group and prepare them for other activities or to revive a group that has slowed down or become bored. All of our games will work with any age group. We have divided our games into those using balls, those that require props and/or advance preparation, inside sitting games, and quick and easy icebreaker games to make it easy for you to choose the perfect icebreaker activity. Whenever a ball is involved, participants must move quickly and pay attention to be successful. 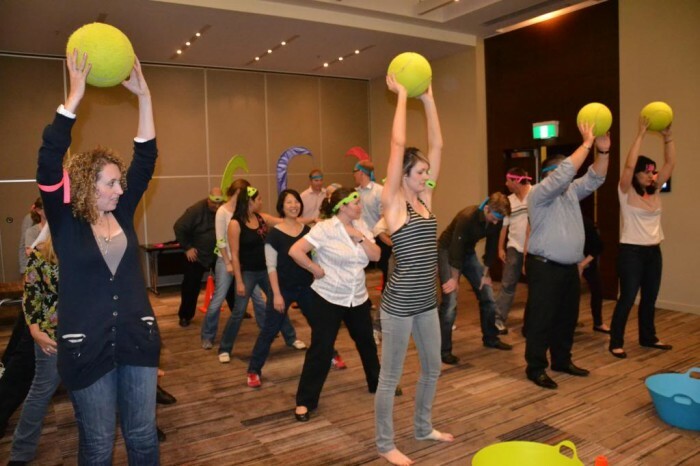 Our selection of active icebreaker ball games are guaranteed to get your group energized. Direct the players that the goal is to pass the ball between the legs of another player. Each time a ball passes between the legs of a player, that player has a point scored against them. The player or players having the least amount of points wins. The ball must be caught and rolled, not thrown forcibly. Divide your group into teams of six to eight players. Blindfold one person on each team. Throw a ball into a designated play area. Team members must stand on marked areas along the sides of the playing area and yell out instructions to their blindfolded teammates, telling them where the ball is located. The blindfolded player must get the ball and return to their team. When they do so, their team receives three points. Additionally, if a blindfolded team member tags another team’s blindfolded member, their team receives one point. Once a team member scores, another team members takes a turn. The winning team is the one with the most points at the end of a set amount of time. Divide your group into teams and have the teams form lines. Give the first person in each line a soccer ball or one of equivalent size. The first player must pass the ball over his head and the second player between the legs. Continue this pattern down the entire line – over, under, over, under – until the ball reaches the end. The last player in the line runs to the front of the line and the pattern starts again – over, under, over, under. The team whose first player reaches the front again first wins. Play this game after “Over-Under” while your teams are still in lines. The leader stands in front of the lines with his arms outstretched towards the teams. At the leader’s command, players stretch their legs astride, all except the team member at the back of the line, who must crawl through the tunnel formed by the legs. When the crawler reaches the front, they stand up and the next team member at the back crawls through. The teams continue until one of the teams is able to touch the outstretched hand of the leader. Avoid cheating by requiring team members to touch the shoulders of the person in front of them. An excellent indoor variation of volleyball, this active icebreaker builds teamwork. Begin by having players sit in chairs scattered around a fairly large room. Explain to the group that the goal is to keep the ball in the air. Bouncing it off the wall, floor, or ceiling is acceptable; however, the ball cannot roll flat on the floor. No one can stand up, and no kicking allowed. There can be only two consecutive hits per player. Also, two players cannot simply pass the ball back and forth to each other to accrue points. The goal is to see how many points the group can get in a set amount of time. This game can also be played by dividing your group into teams and letting them compete against each other. Form your group into two teams and have them stand alternately in a large circle. Provide each team with a different colored ball of the same size, or place easily seen markings on the ball so players can tell them apart. Then the leader says, “Go!” the balls are passed in the same direction from team member to team member. The goal is to move the ball quickly enough that it overtakes the ball from the opposing team. Each time this happens, a point is given the team that does so and the game starts over. The first team scoring three points wins. Make sure the players know they cannot touch the opposing team’s ball. Bang with soft side of fist. Slap with whole open palm. Tap with finger nails only. Three quick taps in one beat. As you continue, participants will start to get creative and will start drumming on whatever is available, tapping, snapping, and slapping. A quick and easy icebreaker activity, this game also works well played with teams. Purchase feathers at a local craft store. If you are playing in teams, have different colored feathers for each team. When you yell, “Go!” the participants are to start blowing and keep the feathers in the air. The individual or team who manages to keep their feather in the air longest is the winner. Prepare for this icebreaker activity by freezing several trays of ice cubes. Put the ice cubes in large bowls. When you yell, “Go!” everyone grabs an ice cube and proceeds to melt it without using their mouth. They can use the warmth of their bodies; fun to watch, but not as fun to do! To score, a toss must be completely in a boundary and not touching a line. Each player throws five bean bags and their score is determined at the end of their turn. If you wish, players can compete against each other by alternating throws. Hold a scarf in each hand. Toss one up in the air, not too high, slightly crossing the body, with your palm facing out. When it reaches its height, toss the second scarf, slightly across the body. Catch each scarf in the opposite hand, with your palm facing out. Focus on tossing, not catching. Once your group gets the rhythm, add the third scarf. It helps to chant, “Toss, toss, toss,” as your group does so. Juggling with scarves is possible because the scarves are large and easy to grab. 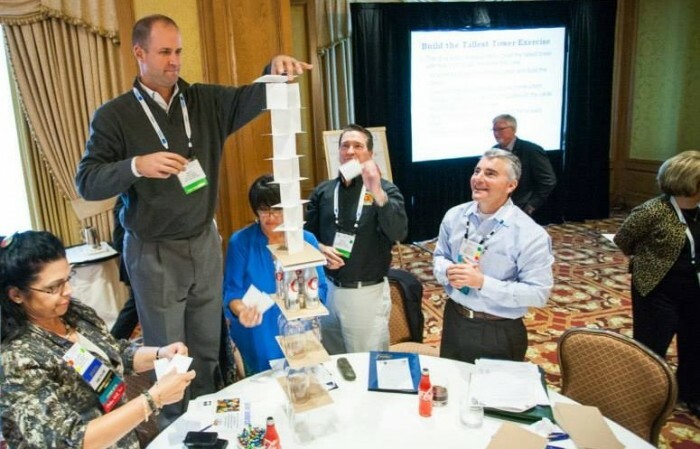 An excellent inside icebreaker activity, you will need Ping-Pong balls, small rubber balls, or any small item that will work if thrown into a cup. You will also need a table and five 20-ounce hard plastic cups. Place the cups in the middle of the table and have a player take a position at each end. Players must stand up – no leaning – and attempt to throw the chosen objects in the cups. The middle cup gets three points; the two next to the middle, two points; and the ones on the end, one point. The first player who reaches ten points wins. Another person replaces the loser and the game continues. You can also have pairs play this game. You can use the Ping-Pong balls from the previous game for this fun challenge. Divide the players into two equal teams and have them stand and hold each end of a bed sheet. Place a Ping-Pong ball on the sheet. The goal of the game is to get the Ping-Pong ball to fall off the other team’s end of the sheet by raising then then lowering it in the air. 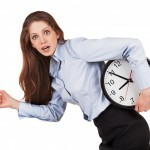 Set a time limit, and the team that manages to do so most frequently in the set amount of time wins. Have your group stand at least five feet apart, so that arms are not touching. Tell them that you will be calling out a number and when you do so, they are to find others and form a clump. When you all out the number, you will call out one a least one number less than the group’s total. Someone will not be able to find a clump to join. The left out person is out of the game. Continue until you have a clump of two – the winners! Divide players evenly into two teams of three people. Arrange chairs in the center of a room in the formation of a tic tac toe game with space to move between the chairs. If you wish, you can mark out grid lines with tape on the floor or rug instead of using chairs. Number your players one through six and write the numbers on small pieces of paper, fold them, and put them into a bag, basket, or box. Draw a number, and the person with that number takes a seat or space. Continue until all chairs or spaces are full and see which team has managed to have three in a row. You can repeat this game as many times as you wish. Having people caught in a “frozen” position provides laughter and fun. Our three activities provide choices and variety for many groups and situations. As the name implies, participants dance until the music stops. When it does, they freeze in place. If someone does not freeze immediately, they are out. Choose music suitable for the age and interests of your group. Participants make funny faces and freeze when the leader yells, Stop!” The most fun comes from having half the group watch the other half freeze their faces. This well-known playground game works well as an icebreaker activity and can be played indoors or outdoors. One person is chosen to be “it.” Whenever “it” touches another player, that player must freeze in place, with their feet wide apart. The frozen player can only be “unfrozen” if another player crawls between his legs! The last player frozen becomes “it” for the next round. 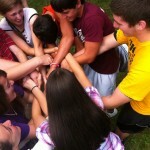 Active icebreaker games prepare groups for working together and keep the energy level high. Choose one from our list for fun and excitement.